This is a pair of interesting new table wines from the well-known Cava producer Codorníu. 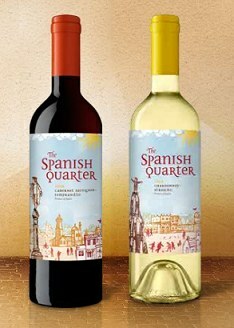 Launched as the first two wines in a new ‘brand’, the white is an unusual blend of Chardonnay and Albariño, whilst the red a slightly more familiar liaison between Cabernet Sauvignon and Tempranillo. Both are designated as a ‘Viñedos de España’, with no specific regional appellation given. That might sound alarm bells, suggesting cheap Spanish ‘plonk’, but in fact these are quality, modern wines made from estate-grown grapes by head winemaker, Olivia Salas, who has worked in top wineries in France, Chile and New Zealand as well as in Spain. The brand has already been launched in the USA, where it is apparently selling well. I suspect the US market’s propensity for sweeter wines is a key factor, because both of these wines are rather too sweet for my palate, and it is not the sweetness of ripe fruit, but of residual sugar. I also suspect that the recommended retail price of £7.99 is one that you will rarely see: that promotions and discounting will bring the price down by a pound or two to a level where, frankly, they will sit more comfortably. The packaging of these wines is brilliant, the provenance is good and the fusion of indigenous grapes with international varieties intriguing. They are well made wines with plenty of fruit and I concede their inherent sweetness will appeal to some drinkers rather more than it did to me. The wines are priced at £7.99 and so far are available in Tesco Vin Plus (Calais), Magnum Wines (Swindon) and Den Boer (Oxfordshire). It is quite exuberantly fresh, with creamy, lemony aromas to the fore and just a hint of pineapple. It is packed with flavour on the palate, though I find the residual sugar just too high for my tastes. It has an off-dry edge, and the bold, tropical ripeness of fruit adds to the sweet sensation, but good acidity does add some much-needed clarity on the finish.